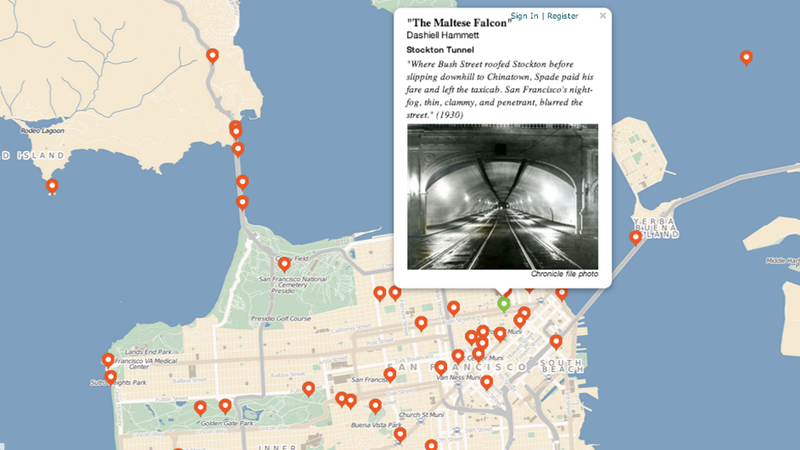 In the lead-up to Litquake, the annual city-wide literary festival that kicks off this Friday, the San Francisco Chronicle just launched a seriously impressive online map marking some of the Bay Area’s most iconic moments in print. The extensive resource is organized by tabs, each of which has its own dedicated collection of site-specific pins from Oakland to Sausalito and everywhere in between: Places points out real life monuments like Allen Ginsburg’s apartment(s) and Ken Kesey’s cottage; Authors acts as guide to the need-to-know names of today; and Passages offers bite-sized snippets of appetite-whetting text. Perhaps most exciting for current locals (or to-be tourists) is Booksellers, a genuinely great (searchable!) tool for anyone who lives to spend long afternoons stuck in stacks and stacks of paperbacks. It's got the usual suspects— of course that ol' North Beach Beat-mecca City Lights and the Richmond's very own Green Apple are listed—as well as tons of teeny, lesser known additions. I’ve lived here for seven years now but can still remember tearing through Armisted Maupin’s endlessly engaging Tales of the City series in high school, living vicariously through newbie Mary Ann Singleton as she took on the quirks and outsized personalities of SF. I’ve since met my own cast of characters, and these maps show that this seven-mile-square town has never stopped being strange and exciting, helping to inspire scores more folks through the ages. Pair this with the real-fictitious spots catalogued on the Infinite Atlas for David Foster Wallace’s massive masterpiece, and well... more, please! These are so much fun.